TNH: How you can say that Newton did not discover Second Law Of Motion which is taught in 252 countries of the world? 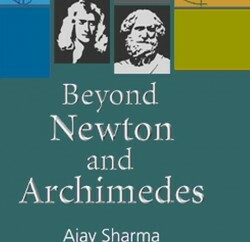 Ajay Sharma: Newton summed up his work in the Principia, 8th May 1686. Its three editions were published in, 1687, 1713 and 1726. Newton gave three laws of motion in it. Initially book was published in the Latin. The three laws as taught to students were given in book at page 19. The first and third laws as taught all over the world, are same as given by Newton in the Principia, BOOK 1. But second law of motion (F=ma) as we teach now, is NOT the same as given by Newton. One can compare 2nd law of motion in 9th -10th class textbooks and Newton’s the Principia. If someone thinks I am wrong then one SHOULD give name, year, page and publisher of document when Newton published F =ma. TNH: What is Newton’s Second as given in the Principia and how it is taught today? F is force , u is initially velocity, v is final velocity. As Newton’s Second Law of Motion taught in 9th and 10th class books. F is force, m mass of body, u initial velocity, v final velocity, t is time, a is acceleration. So the Newton’s Second law of Motion as given in the Principia is entirely different than what we teach today. TNH: Who discovered F =ma (now known as Second Law of Motion)? Ajay Sharma: Exactly nobody can answer this question that who discovered F=ma ? There are no evidences when F=ma replaced Newton’s genuine Second Law of motion. Nobody knows who gifted F=ma to Newton. So it is the most mysterious riddle in Physics. Instead of solving it , this issue is not discussed by scientists. TNH: If Newton did not discover the Second Law of Motion then other scientists should say the same, may be even reluctantly. B Pourciau , ‘ Is Newton’s second law really Newton’s ? American Journal of Physics , 79 1015, 2011: B. Pourciau, “Newton’s interpretation of Newton’s second law of motion. law,” Arch. Hist. Exact Sci. 60, 157–207 (2006). Also websites of some scientific institution also point out this. TNH: Should it be regarded as fault of Sir Isaac Newton? Ajay Sharma: No …no, not at all. Newton died in 1729, it after death of the legend Newton’s Genuine Second Law of Motion was replaced by F=ma. 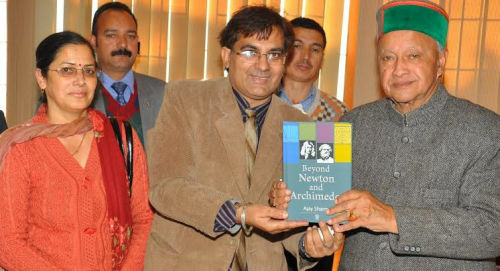 So how Newton can be held responsible for development after his death. Other scientists are responsible. TNH: What are mistakes in F=ma, you have found. TNH: If Newton’s Second Law of Motion predicts undefined mass (m =F/a =0/0) then it is serious limitation? Ajay Sharma: This is what I am saying. It is all in High school textbooks. Only thing is that we have to understand it scientifically. There cannot be bigger limitation than this. Why billions of books which quoted F =ma, don’t address this limitation. TNH: Even then science is developing? Ajay Sharma: A person can lead successful life with an eye. Then it does not mean he is not disabling. For about 1900 -2000 years we preached that earth is centre of universe and Sun revolves around it. Even in that era science developed. Thus science is not static, it is expanding and relative. Further Newton’s Second Law of Motion is not used in medicine or internet etc. Some twist in understanding will accelerate scientific development will not suppress the same. TNH: What is the remedy? Ajay Sharma: We need to re consider Aristotelian approach, which was nullified by Galileo and paved way for Newton’s first law of motion. Philoponus (490-570) and Buridan (1300-1358) have contributed in the regard, along with many. Galileo (1564-1642) thought of ideal or hypothetical system when a body is pushed, will move with uniform velocity forever. There is no such system on the earth. We need theories for practical systems (body stops after moving). So this is the approach. TNH: What should be future plan for improvement of science? Ajay Sharma: Firstly we should finally confirm who discovered F=ma ? How it replaced Newton’s genuine law of motion (given in the Principia). Is it the biggest scientific deception? But on this issue Newton is not responsible. Scientists have to find out that who discovered second law of motion and how it replaced genuine second law of motion. Newton(1642-1727) himself have serious disputes with Robert Hook (1637-1703) for priority of theory of colors, a part of law of gravitation and G Leibniz (1646-1716) for discovery of calculus. Who gifted the Second Law (F=ma) to Newton peacefully and without disclosing identity? TNH: What are your future plans? Ajay Sharma: I have published research papers in international journals pointing out limitations of Einstein’s Sep. 1905 derivation of Einstein’s E=mc2. Then new generalized equation for mass energy inter-conversion equation ‘dE=Ac2dm’ is given. Elaborating history of E=mc2, limitations of its derivation of E=mc2, applications of new equation in nuclear physics , cosmology and astrophysics book titled ‘Beyond Einstein’s and E=mc2 has been completed. Soon it is being published for consideration for publication. Earlier, during his academics, Sharma first raised this issue and had pointed out the limitation of Newton’s Second Law of Motion e.g. under certain conditions it predicts undefined mass (m=F/a =0/0). However, none cared him, anyhow self motivation and the rarest optimism kept him working in long journey of 31 years. He hass also questioned and generalized 2265 years old Archimedes principle, 330 years old Newton’s Laws, Sep. 1905 derivation of Einstein’s E=mc2 , developed a new theory on rising, falling and floating bodies, formulated a new theory of formation of universe etc. 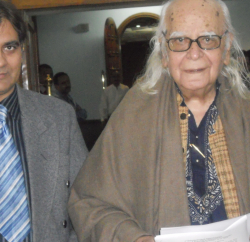 His research papers are published /being published from USA, England, Canada etc. The recognition came from abroad. In this book, Ajay Sharma has taking into account the current experimental and technological accomplishments and theoretical methods and stresses the basic laws of science, i.e. Archimedes principle, Newtons’ laws, need to be generalized.